Indocalamus tessellatus growing herbaceous of the genus Indocalamus also known as Large-leaved bamboo, Indocalamus tessellatus perennial evergreen plant, used as ornamental plant, can grow in temperate, subtropical, mediterranean climate or as houseplant and growing in hardiness zone 6-10. Box of 5 Indocalamus Tessellatus, Cold Hardy Tropical Bamboo Plant. Box of 10 Indocalamus Tessellatus, Cold Hardy Tropical Bamboo Plant. 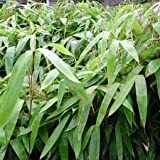 Indocalamus Tessellatus, Cold Hardy Tropical Bamboo Plant, up to 2' Long Leaves by Maya Gardens, Inc.